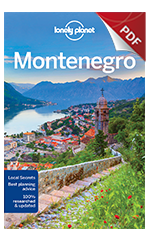 Why buy a chapter on Dubrovnik for a visit to Montenegro? That’s easy: why come this close and not visit one of the most beautiful cities in the entire Mediterranean, if not the world? Coverage includes: History, Sights, Activities, Festivals & Events, Sleep-ing, Eating, Drinking & Entertainment, Shopping.